Il Mezzo Milione: Day 23 - Midnight at the Oasis. A late start today for a short hop north to the Darwaza gas crater. The morning off meant the bike got a check over and a wash. Apparently it is the law in Ashgabat that if it rains you must wash your car within 12 hours so it doesn't make the place untidy. It rained just as we left the carwash so decided not to go back and do it again. An act of wanton rebellion that may topple the regime. The road north crosses the Karakum Desert. Nothing to see but sand, scrub and camels. We stopped for fuel in a village with sand covering the roads, camels and cows in thorn brush enclosures and people living in yurts. A far cry from Ashgabat where they were repainting the white lines outside the Presidential Palace because they had got a bit dirty. The road itself is tough. Parts have been made from soft tarmac that deforms into ruts and ridges. Other parts have poor foundations and potholes 10 or 20cm deep have opened up. You thread a careful line through all this but sometimes there is nowhere to go and the suspension bottoms out as you hit a big one. Alongside this nightmare is the new road. Mile after mile of graded gravel waiting for tarmac. It is a far better surface than the old road but it isn't finished. That doesn't stop the trucks (and the odd motorcycle) using it when the ruts get bad. This is of course forbidden and there are plenty of police roadblocks and patrols to catch you. 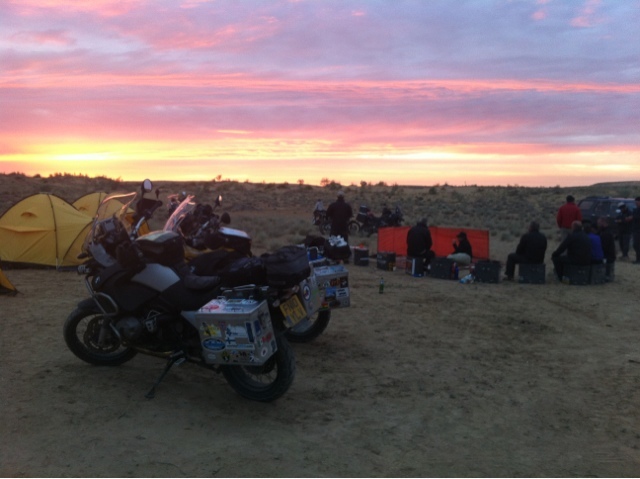 After 270km we turn off and drive across the sand to a wild camp. Our hosts have already started the fire and soon shashlik (kebabs) of chicken and spicy bean soup are served. (Inevitable joke: It's bean soup. Yes, but what is it now). As the sun sets we get into 4x4s and head for the Mouth of Hell.